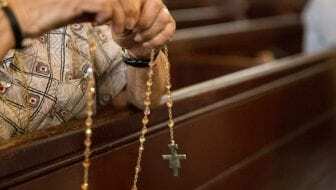 ALBANY, NY (WSKG) – A feud has been growing between Governor Andrew Cuomo and leaders of the Catholic Church, over an abortion rights bill the governor signed last week. The governor has been fueling the flames of the disagreement. The Reproductive Health Act codifies the abortion rights in the Roe decision, and permits late term abortions if the life or the health of the mother is threatened by the pregnancy or if the fetus is determined not to be viable. New York Cardinal Timothy Dolan, appearing on the Fox News program Fox and Friends, condemned the Reproductive Health Act, and its provisions for late term abortions, as “ghoulish” and “grisly”. Dolan recalled a time when supporters of abortion rights were more sober about the procedure, saying it should be “safe and legal”, but rarely performed . The governor’s own father, the late former Governor Mario Cuomo, also sparred with the church over the issue of abortion. The elder Cuomo was personally against the procedure, but said he could not impose his views on a civil society.